Mix Juice’s Vanilla Toffee Cheesecake is a decadent e-liquid, sure to please the taste buds of any dessert lover. A blend of rich toffee, creamy, vanilla cheesecake and buttery biscuit –this is an e-liquid for lovers of all things divine. Mix Juice short fill eliquids are mixed with an 70/30 blend of VG to PG, perfect for carrying flavour and blowing thick, sweet smelling clouds. 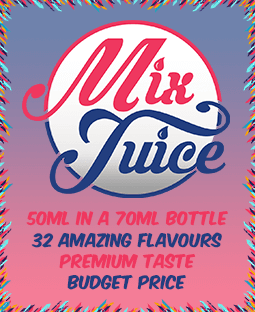 You can buy your Mix Juice Vanilla Toffee Cheesecake e-liquid on its own, nicotine free or you can add 10ml or 20ml or Nic Shot to create your desired strength.